The Cool Shirt (Cool Suit) Club Systems are the most popular driver system that we manufacture. The Cool Shirt (Cool Suit) Club System 24 combines the advantage of Cool Shirt®’s temperature-controlled cooling power with hours of cooling time. Ideal for those racing applications where space is not as much of an issue and the races may run long. Versatile enough to be perfect for everything from road courses to oval track racing, the Cool Shirt (Cool Suit) Club 24 System keeps you cool and alert for the entire race when going the distance really counts. The Cool Shirt (Cool Suit) Club 24 System comes with a 24qt cooling unit with an internal pump which supplies cooled water to the shirt through 8ft of double insulated hose with automatic shutoff / quick disconnects. The optional Temperature Control Switch gives the driver complete control of their comfort while in their race car. Total weight for the Club System is only 4lbs. 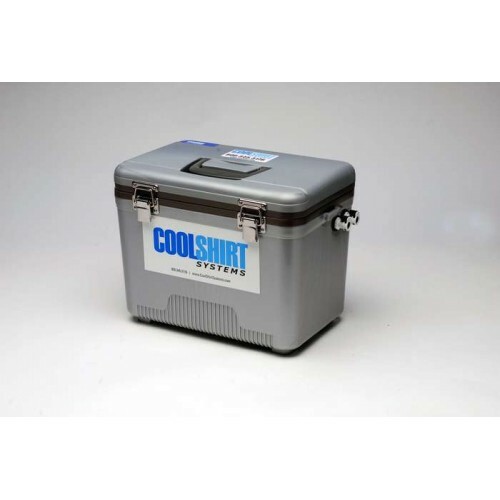 The CoolShirt Club Cooling System (Cool Suit) is the most popular driver system that we sell. The Cool Shirt (Cool Suit) Club System 24 combines the advantage of Cool Shirt®’s temperature-controlled cooling power with hours of cooling time. Ideal for those racing applications where space is not as much of an issue and the races may run long. Versatile enough to be perfect for everything from road courses to oval track racing, the Cool Shirt (Cool Suit) Club 24 System keeps you cool and alert for the entire race when going the distance really counts. The Cool Shirt (Cool Suit) Club 24 System comes with a 24qt cooling unit with an internal pump which supplies cooled water to the shirt through 8ft of double insulated hose with automatic shutoff / quick disconnects. The optional Temperature Control Switch gives the driver complete control of their comfort while in their race car. Total weight for the Club System is only 4lbs.